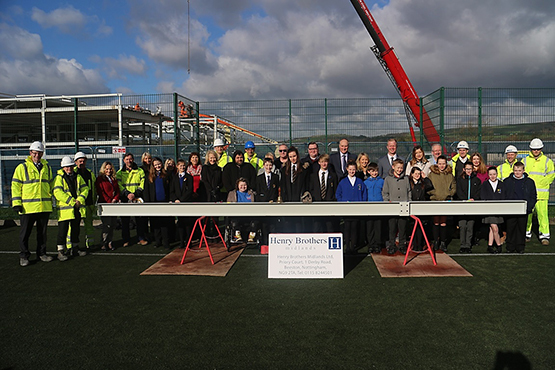 The Head Teacher for the new Glossopdale Community College was joined by key representatives from Derbyshire County Council, The Board of Governors and pupils from Glossopdale Community College and surrounding Primary Schools to sign a piece of steel, marking the completion of the dance studio, at the event held on the 21st March 2017. With the final piece of steel going up, pupils and staff will really get a feel for the impressive learning environment that is taking shape and will start to see their vision to have an outstanding learning centre at the heart of their community being realised. The 1200 capacity school will cater for 11 – 18 year olds and will include a specially designed sixth form centre, performing arts centre and leisure centre for community use, allowing pupils to be taught in one multi-use community venue. Works are on schedule and will be completed by autumn 2018. Entry submitted by Henry Brothers.